PEM is a passive dewatering system, known as a “soft” technology, and was patented in 2003 in the USA. PEM – Pressure Equalizing Modules – are independent drain tubes installed vertically into the beach. They have slits allowing water to enter but sand stays out. Each tube is typically 2½ in. by 6 ft. but vary in size. They form a grid stretching from the dunes to the water line. The PEMs are placed 1-3 feet below the surface, however the exact design of the installation will vary from site to site. The tubes act as “connectors” between different layers of groundwater in the beach. With PEM installed water is able to drain from the beach via the layer with the lowest resistance (typically a coarser layer), this leads to a reduction in groundwater pressure. Air entering from the top of the PEM replaces the water. Improved drainage will result in a beach where waves sink in more easily, leaving more suspended sand on the beach than they take back to sea. Over time the beach will build up. PEMs are placed subsurface and are invisible except after an unusually heavy storm, where they may be visible during a short period of time. PEMs are independent modules and the effect of one module is not dependent on other modules. No power is needed to operate the PEM. No down-drift erosion and no scarps are formed. Under most conditions the PEM system causes a new equilibrium profile to be formed with a wider and higher beach profile. Provided there is good water circulation activity (strong winds or tide), the new equilibrium profile will normally be established in 6-12 months. 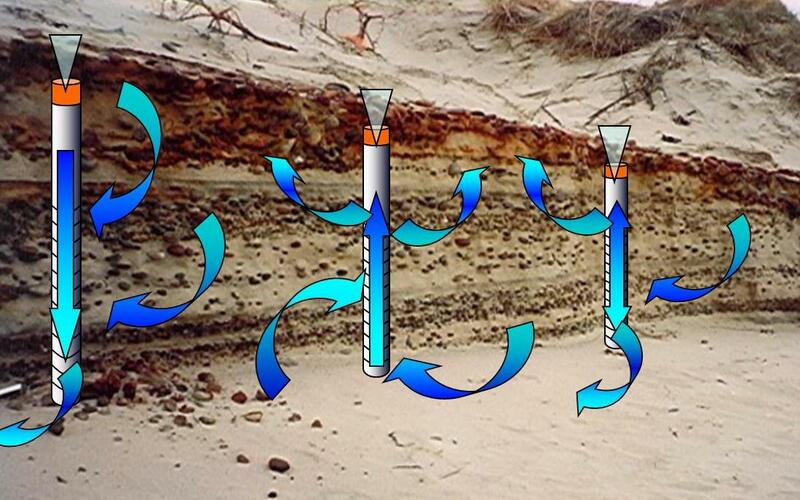 For the PEM system to function properly, sand has to be in littoral drift. If this is not the case new sand may have to be added. A combination of beach nourishment and the PEM system to maintain the sand is a viable solution. PEM is a “soft” solution applying a small change, just enough to tip the balance in the beach, resulting in the accretion of sand. For a demonstration of how PEM affects the groundwater level and accretion of sand see the animation on the Home page.